Tucson Arizona is approximately 18 miles north of Ruby Star Airpark and contains all of the amenities you’d expect from a major city in the United States including an International Airport. Tucson is the county seat of Pima County, Arizona and home to the University of Arizona. The 2010 United States Census puts Tucson’s population at 520,116 while the 2013 estimated population of the entire Tucson metropolitan area was 996,544. Green Valley Arizona is 11 miles east of Ruby Star Airpark and is one of the largest active adult communities in the world. It provides many opportunities for shopping, dining, recreation and has modern facilities for your medical needs. Green Valley is actually a collection of individual housing developments in southern Arizona. Green Valley’s population is over 21,000 and growing. In fact, guest pilots are able to park their airplane at Ruby Star Airpark while enjoying their home in Green Valley or Sahuarita. Tie down space is available at Ruby Star, with hangars and shade ports coming soon. 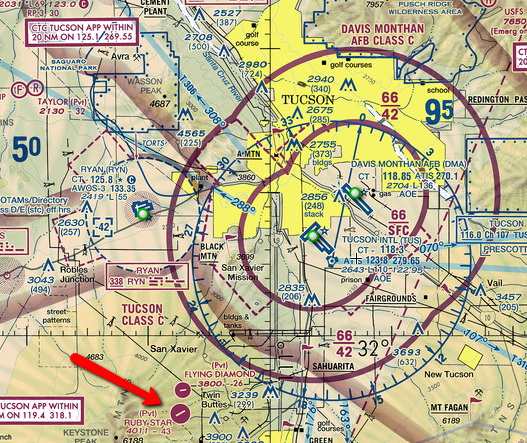 The Town of Sahuarita Arizona is also west of Ruby Star Airpark. and just south of the Tohono O’odham Nation. Sahuarita’s population was 25,259 as of the 2010 census. Extensive shopping and entertainment can be found in Sahuarita. The Sahuarita Unified School District #30 is located directly off Interstate 19 at exit 75, Sahuarita Road. At this campus are Sahuarita High School, Sahuarita Middle School, Sahuarita Intermediate School, Sahuarita Primary School, and the district administrative offices. Ruby Star Airpark children are picked up by school bus at our main gate. Additional educational opportunities are available at the University of Arizona and Pima Community College located in nearby Tucson, Arizona. From Phoenix and Tucson, take I-10 south. I-10 meets I-19 just south of Tucson. Take I-19 south towards Nogales, Arizona. Turn right – head west. Travel west on Duval Mine Road for 4.5 miles. At Mission Road, turn right (north) for 2.8 miles. At Magee Ranch Road, turn left (west). Travel 2.2 miles to Ruby Airpark Road (on the right). There is an electronic gate to the airpark. (Please contact any member of the board for the gate code). Once you enter the airpark, the runway is straight ahead. And remember, airplanes have the right of way at Ruby Star Airpark!